Still here, but would rather be here. 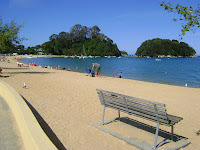 Sunny Sunny Kaiteriteri in Nelson. We spent our Christmas holidays up here and it was just great. So great in fact that we bought this wee cutie. 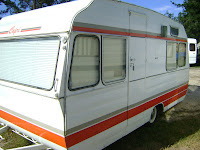 Our very own caravan, so we can spend summers anywhere we like, how exciting is that!! For those of you who know me will be thinking I have lost the plot. But I loved being outside in the sunshine, walking the beach and just lazing around. We have our first test drive at Easter, so I will let you know how it all goes. Life as usual continues to be full on. February already, Where have those days gone to. I spent all day in my sewing room trying to finish some summer garments, before the summer dissappears. I will take some pictures tomorrow, as the light was not suitable by the time I packed up for the evening. Hope you are all enjoying this lovely spell of hot weather.